The Sentix economic expectations continue to languish. The index is hovering in its lowest levels since 2012 as the ECB begins to remove its 'special sauce.' Europe has been showing much weaker signals on economic activity recently. And at the same time, inflation is falling. It may be a 'coincidence' since oil prices have fallen off and they too are highly correlated with inflation. In the EMU, Brent crude oil prices have a 0.86 correlation with manufacturing PPI prices. Brent has a 0.665 correlation with the EMU HICP and a 0.31 correlation with the HICP core excluding tobacco and alcohol. But inflation also tends to be pro-cyclical rising in expansions and snuffed out or brought to lower rates of expansion by recessions. So when inflation and growth both turn lower together, it is a good idea to be on your guard which is different from jumping to conclusions. But better to jump to a conclusion than off a bridge. Of the 15 EU/EMU countries in the table, all but Ireland have their PPI falling in December. Eight also show prices decelerating in November when Brent prices also fell. Over three months, prices are falling in ten of 15 countries. Over six months, they are falling in only four of 15 countries. 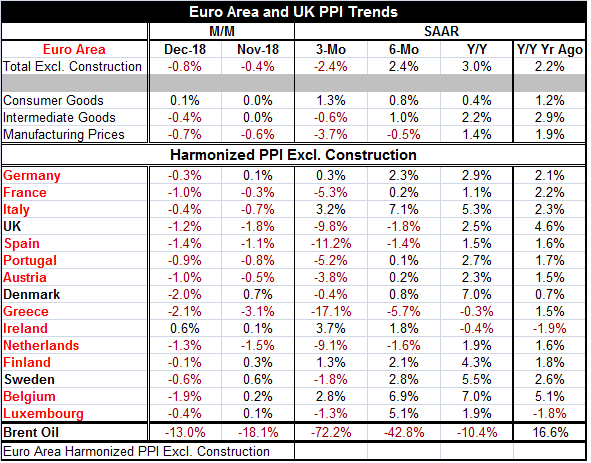 But PPI inflation is decelerating over three months compared to its six-month annual pace in 14 countries and PPI inflation is decelerating in 12 countries over six months compared to their 12-month pace. That's a lot of price weakness. Still, it is short term weakness since 12-month inflation is still up compared to what it was 12-months before that in all but four countries. The PPI rate is at 3% year-over-year, decelerating to 2.4% over six months and to a -2.4% pace over three months. The bottom line for PPI inflation is that prices either are falling or the inflation rate is declining across the board for all 15 of these countries with Ireland as the most frequent exception and in some cases the only exception. Of course, PPI inflation is more readily and powerfully affected by oil prices than the HICP prices that EMU targets, but there are influences on both measures. And this price weakness comes accompanied by not just by current weakness but by forecast downgrades from the IMF. It is surprising how quickly the global economy has transitioned from having central banks bristling to end special stimulus programs to having a global economy with weakness encroaching in some form nearly everywhere…nearly everywhere. I did warn on this. One reality that no central banker has wanted to bear in mind is that growth has been less than stellar even when aided by special stimulus. This is true in the U.S., Europe, and Japan. It was more than a little 'heroic' for central bankers to assume that this extra bit of support could be pulled out and replaced with a move toward restrictiveness (in the case of the U.S., in any event) without consequence. Also someone might have taken a hint about growth vulnerability from the fact that inflation globally just has not been able to get to and stay at 2%. Wasn't that a clue about weakness? Or what about the Fed (and others) being totally dismissive of the flat and flattening U.S. treasure yield curve? Ignoring that was like ignoring a person standing on the corner screaming for help! The yield curve may be the best economic indicator of all time in terms of the simple veracity of its signal. Central bankers have been on a mission to get things back to normal as if taking the patient out of intensive care early and sending him back to work would make him heal. Central bankers have been too worried about their own reputations and looking for excuses to hike rates, lest inflation overtake them and cause them to bear the shame of being too loose for too long. Yet, the reality of this situation is that inflation is not to be found and it is overtaking no one. Central bankers have been focused on getting rates and polices in general back to 'normal.' They labored under the misguided decision that they had waited long enough for normalcy to be restored. What central bankers have missed is that the financial crisis was a financial crisis alright. There was a recession that accompanied it too. But the financial crisis was also a watershed of sorts an admission that the economy is now under different influences and central bankers never bought into that. The private sector adopted the term 'new normal.' Then everyone forgot about it. Guess what? It's back! We just have to figure out what it is and central bankers need to realize that it is different from the old normal – perhaps very different. And that may be a hard lesson for them to learn. If it is, it will be a hard lesson learned for which the rest of us will pay the consequences.